As an entrepreneur and FlightSiteAgent, finding cost-effective marketing opportunities is key to making a success of your business. Marketing experts will tell you that there is no winning formula, it all boils down to knowing your audience and where to find them. The problem is that if you’re just starting, with little to no leads, knowing where to start can be challenging. The first step would be to register for free online. The process is fairly simple, requiring details like the agent’s name, email address and a password. You don’t need to worry about having a company registration number and can simply enter a single digit in order to skip the step. 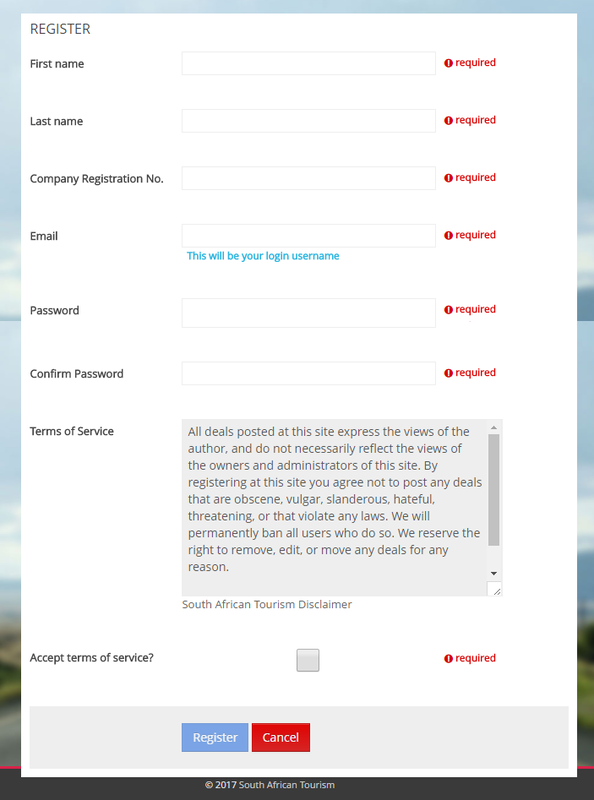 Make sure that you’ve completed all the fields marked with a red exclamation mark before you try to submit. Once you’ve completed registration, you can immediately upload your deals! If you’re logged in, you’ll see the “create your deal” button in green and a sidebar with options to view deals currently on offer, download details or gain insights as to who viewed your deals (Reports). As this platform is open to everyone, the competition can be quite tough so only the best stands out. If you’re lucky, Sho’t Left might even choose to share your package on their social media! A unique product usually combines things like transport, accommodation and activities that appeal to a specific audience. To be considered though, you have to make use of high quality and attractive images to accompany your package. In order to load a deal, you have to give it a title, summary and description. A catchy name is the first thing to consider, as this is what draws people in to read more. Consider something like “2 Nights Drakensberg Adventure”. This provides the duration, destination and a sense of the type of audience this is aimed at. But could it be catchier? Possibly! “The Drakensberg Adventure of a Lifetime” provides less information, but definitely draws attention. As long as important information like the duration is still easily available (in the summary), this might be the better title of the two. Next you have to provide the summary, which can simply be something like “7 Nights Drakensberg stay at the Stables Hotel.” It is only when you get to the description that it is worth adding details like room categories, activities, meals included, etc. Based on the above, you’ll choose the type of experience you’re offering. Options in the drop-down menu include adventure (think skydiving), spa (self-explanatory), city breaks, mountain escapes, weekend getaways and more. You can also choose the package type with options including backpackers, families, self-catering, affordable, etc. The only currency available is the Rand, but you have the option of pricing per person, per person sharing, etc. You must also add at least one destination to your package, but it is possible to add multiple destinations should it be applicable. Only thereafter can you add the itinerary, which helps you break down the package into each day. This is especially important if it is a multi-day trip, as it allows you to show what activities each day involves as well as when/if you’re travelling to another destination. Please also indicate which mode of transport is included or not included. The itinerary isn’t a requirement, but it is the only way to add images to your package. Very importantly, you have to add your package’s booking dates (Publish Period) and its travel dates (Validity). When selecting the Travel Agency, you can either choose FlightSite if it is a package provided by us or you can add and choose your own travel agency name. Finally, in order for bookings to come through to you, you should add either a booking URL (website link) and/or an email address where you’ll receive enquiries. You can indicate which booking method you prefer and add a link to a Youtube video illustrating the package, should you have one. Give your package a final look over before submitting it for approval. Once your package is approved and live on the website, you can share it on social media. So there you have it, just another free marketing tool for you to make the best of your business!